Click here to go to Longfellow Middle School’s WebsiteLongfellow Middle School is a safe, cooperative, tolerant and nurturing community of students, staff and teachers. Our small campus allows us to teach a rigorous curriculum, give personal and meaningful attention and meet the needs of all our diverse learners. With the support of an active PTA and regular family outreach, Longfellow is truly a community that embraces the whole child. 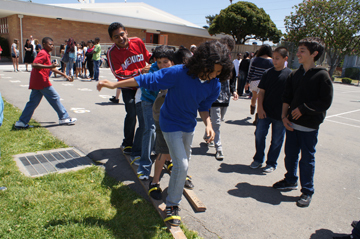 Academic Enrichment: All students at Longfellow have the potential and ability to achieve academically. With Nationally Board Certified Algebra teachers, every 8th grader has the support they need to flourish in 8th grade Algebra. Our English department offers a rigorous and well-supported writing and reading program that has created an entire school of avid and habitual readers. Longfellow students always have a book in hand. Our science teachers offer hands-on learning opportunities as well as field trips to open the worlds of physical and life sciences. Our social studies teachers guide students through the worlds of ancient peoples, medieval times all the way through to the founding of America. We provide enrichment classes to students who need additional support with academics, as well as elective courses such as Art, Spanish, Drama, Computers, and Publishing. Teachers at Longfellow participate in a variety of staff development programs including GLAD (Guided Language Acquisition Design), Culturally Responsive Teaching Practices, and how to use data to drive instruction through Professional Learning Communities (PLC). They also collaborate regularly around best practices and standards-based lesson planning. Above and beyond the school-day curriculum, students have the opportunity to participate in a variety of specialized academic support groups such as the Berkeley Scholars to CAL program, after-school homework centers, and the ELL homework center for English Language Learners. Several of our teachers work in the extended day program so that they can best support students who they work with during the regular school day. Extended Day Program: Serving over one third of the school population, Longfellow’s extended day program offers both academic support and enrichment. Students have the opportunity to participate in Homework Centers with classroom teachers and tutors from UC Berkeley, organized team sports as well as dance, arts, and music. This program is open until 6:00 pm. The fees are sliding scale and scholarships are available. Facilities: Located in a quiet South Berkeley neighborhood, Longfellow Tigers are surrounded by a safe and stimulating environment. Our auditorium has a recently updated surround sound system. We offer a softball field, basketball courts, an enclosed gym and a fully stocked library with media technology. In addition, there is a computer lab available for students who may not have computer access at home. Every classroom also offers a number of computers for student use. Our annex building was renovated last year and is a welcome upgrade to our campus. Music Program: Our music program is renowned for excellence and achievement. From the moment students enter 6th grade they are exposed to a variety of musical opportunities. We offer everything from choral singing to guitar to orchestra. Our famous jazz band recently had the honor of playing a gig at the famous jazz club Yoshi’s in Oakland. We recently even created a rock band that often brings down the house with their performances. All students are encouraged to participate in music and it brings a special quality unique to Longfellow. Nutrition and Gardening: Longfellow students are encouraged to develop healthy eating habits and an understanding of how food is grown and where it comes from. Our beautiful and bountiful garden sits across from the Annex on Ward Street where students have a view of the sunflowers. The garden produces a variety of fruits and vegetables that students assist in tending to. As a participating school in the Linking Education and Food (LEAF) Grant and in the California Nutrition Network, Longfellow students enjoy the benefits of cooking and gardening instructors as well as enhanced nutrition education in both science and physical education classes. Students also participate in cooking and gardening in the after-school program. Sports: Longfellow has a wide variety of interscholastic sports teams that compete in a local league. Teams include volleyball, basketball, softball, flag football, and soccer. We have a proud legacy of outstanding student athletes- many of whom are currently attending four-year Universities on athletic scholarships. Our athletes always go on to participate successfully on teams and in competitions once they reach High School. I like Longfellow because I feel comfortable and safe here. I know a lot of adults will help if I need it. The kids are nice here. Longfellow is a great school because you can play music 3 times a day here! And our math teachers are very good. The counselors are really supportive. They help me with my problems and with friends. I like our sports. I play sports all year after school. Longfellow is fun because I get to meet lots of new people.